The Boeing CH-47 Chinook is a versatile, twin-engine, tandem rotor heavy-lift helicopter. Its top speed of 170 knots (196 mph, 315 km/h) was faster than utility and attack helicopters of the 1960s and even many of today. Its primary roles include troop movement, artillery emplacement and battlefield resupply. There is a wide loading ramp at the rear of the fuselage and three external-cargo hooks. Chinooks have been sold to 16 nations; the largest users are the U.S. Army and the Royal Air Force (see Boeing Chinook (UK variants)). The H-47 is now produced by Boeing Integrated Defense Systems. The original Model 107/YHC-1A was rejected by the U.S. Army as being too small for its needs. The YHC-1A was then evaluated by the US Marine Corps, and ordered as the HRB-1 (CH-46A after 1962). The Army then ordered the larger Model 114/HC-1B. The pre-production Boeing Vertol YCH-1B made its initial hovering flight on September 21, 1961. In 1962 the HC-1B was redesignated the CH-47A under the 1962 United States Tri-Service aircraft designation system. The Chinook is powered by two turboshaft engines, mounted on either side of the helicopter's rear end and connected to the rotors by driveshafts. The counter-rotating rotors eliminate the need for an anti-torque vertical rotor, allowing all power to be used for lift and thrust. If one engine fails, the remaining engine can drive both rotors. 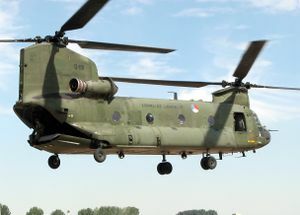 A commercial model of the Chinook, the Boeing-Vertol Model 234, is used worldwide for logging, construction, fighting forest fires and supporting petroleum exploration operations. As of December 15, 2006 Columbia Helicopters, Inc of Aurora, Oregon has purchased the Type certificate of the Model 234 from Boeing. Currently the company is seeking FAA issuance of a Production Certificate to produce parts with eventual issuance of a PC to produce aircraft. The Chinook was also built under license by Elicotteri Meridionali in Italy and Kawasaki in Japan. The CH-47A Chinook entered service in Vietnam with the U.S. Army 1st Cavalry Division in late 1965. The CH-47B was the standard troop transport used by the U.S. Army 1st Cavalry Division in Vietnam. During the Gulf War of 1991, 163 CH-47Ds served in Operations Desert Shield and Desert Storm. The all-weather, medium-lift CH-47A Chinook was powered initially by Lycoming T55-L-5 engines rated at Template:Convert but then replaced by the T55-L-7 rated at Template:Convert engines or T55-L-7C engines rated at Template:Convert. The CH-47A had a maximum gross weight of Template:Convert. A total of 349 were built. The ACH-47A was originally known as the Armed/Armored CH-47A (or A/ACH-47A). It was officially designated ACH-47A by US Army—Attack Cargo Helicopter—and unofficially "Guns A Go-Go"). Four CH-47A helicopters were converted to gunships by Boeing Vertol in late 1965. Three were assigned to the 53rd Aviation Detachment in South Vietnam for testing, with the remaining one retained in the U.S. for weapons testing. By 1966, the 53rd was redesignated the 1st Aviation Detachment (Provisional) and attached to the 228th Assault Support Helicopter Battalion of the 1st Cavalry Division (Airmobile). By 1968, only one gunship remained, and logistical concerns prevented more conversions. It was returned to the United States, and the program stopped. The ACH-47A carried five M60D 7.62x51 mm machine guns or M2HB .50 caliber machine guns, provided by the XM32 and XM33 armament subsystems, two M24A1 20 mm cannons, two XM159B/XM159C 19-Tube 2.75" rocket launchers or sometimes two M18/M18A1 7.62x51 mm gun pods, and a single M75 40 mm grenade launcher in the XM5/M5 armament subsystem (more commonly seen on the UH-1 series of helicopters). The surviving aircraft, Easy Money, has been restored and is on display at Redstone Arsenal, Huntsville, Alabama. CH-47B was powered by two Lycoming T55-L-7C 2,850 shp (2,130 kW) engines. The CH-47B featured a blunted rear rotor pylon, redesigned asymmetrical rotor blades, and strakes along the rear ramp and fuselage to improve flying characteristics. The Chinook could be equipped with two door-mounted M60D 7.62 mm NATO machine guns on the M24 armament subsystem and a ramp-mounted M60D using the M41 armament subsystem. Some CH-47 "bombers" were equipped to drop tear gas or napalm from the rear cargo ramp onto NLF (aka Việt Cộng) bunkers. The CH-47 could be equipped with a hoist and cargo hook. The Chinook proved especially valuable in "Pipe Smoke" aircraft recovery missions. The "Hook" recovered about 12,000 aircraft valued at over $3.6 billion during the war. 108 built. The CH-47C featured more powerful engines and transmissions. Three versions of the "C model" were built. The original "C" had Lycoming T55-L-7C engines delivering 2,850 shp. The "Super C" included Lycoming T55-L-11 engines delivering 3,750 shp, an upgraded maximum gross weight of 46,000 lb and a pitch stability augmentation system (PSAS). Due to difficulties with the T55-L-11 engines, which were hurriedly brought to war to increase payload, they were temporarily removed from the "Super C" prior to 1970 and the very reliable Lycoming T55-L-7C's were installed until the L-11 engine difficulties could be quantified and corrected. This L-7C engine configuration was affectionately referred to as the "baby C" although it was still a Super C. It still distinguished itself from the "C" in that it had PSAS, and an uprated maximum gross weight. The CH-47 A, B, and all variants of the C were not able to receive certification from the FAA for civil use due to the non redundant hydraulic flight boost system drive. A redesign of the hydraulic boost system drive was incorporated in the CH-47D which allowed that model to achieve FAA certification as the Boeing Model 234. 233 CH-47Cs were built. The CH-47 A, B, and all versions of the C saw wide use during the Vietnam war. They replaced the H-21 Shawnee in the combat assault support role. A U.S. CH-47 stands ready to receive medical supplies in Feyzabad, Afghanistan. The CH-47D was originally powered by two T55-L-712 engines, but most are now fitted with the T55-GA-714A. Models CH-47A, CH-47B, and CH-47C, all used the same airframe, but later models featured upgraded engines. With its triple-hook cargo system, the CH-47D can carry heavy payloads internally and up to 26,000 pounds externally, for example, bulldozers and 40-foot containers, at speeds over 155 mph (250 km/h). In air assault operations, it often serves as the principal mover of the 155 mm M198 howitzer, 30 rounds of ammunition, and an 11-man crew. Like most US Army helicopters, the Chinook has advanced avionics and electronics, including the Global Positioning System. CH-47D Chinook of the Royal Netherlands Air Force. Nearly all of the Army production CH-47D models were conversions from previous U.S. Army A, B, and C models. The last US Army D model built was delivered to the United States Army Reserve (USAR), located at Fort Hood, Texas, in early 2002. The RAF versions of the CH-47D are the Chinook HC2 and HC2A. The RAF later ordered eight Chinook HC3s, which is a low cost version of the MH-47E for the special forces operations role. They were delivered in 2001 but still have not entered operational service. The CH-47SD is a modified variant of the CH-47D, with extended range fuel tanks and higher payload capacities. It is in use by the Republic of Singapore Air Force, and the Republic of China. The CH-47DG is an upgraded version of the CH-47C for the Greek Army. The HH-47D is a search and rescue version for the Republic of Korea Air Force. The MH-47D variant was developed for special forces operations and has in-flight refueling capability, a fast-rope rappelling system and other upgrades. The MH-47D was used by US Army 160th Special Operations Aviation Regiment. 12 MH-47D helicopters were produced. 6 were conversions from CH-47A models and 6 were conversions from CH-47C models. The current model used by US Army Special Operations is the MH-47E. Beginning with the E model prototype manufactured in 1991, there were a total of 26 Special Operations Aircraft produced. All aircraft were assigned to the "Nightstalkers", home based at Fort Campbell Kentucky. E models were conversions from existing CH-47C model airframes. The MH-47E has similar capabilities as the MH-47D, but includes an increased fuel capacity similar to the CH-47SD and terrain following/terrain avoidance radar. The CH-47F, an upgraded D model, first flew in 2001. The first production model was rolled out on June 15, 2006 at the Boeing facility in Ridley Park, Pennsylvania, and had its maiden flight on October 23, 2006. The CH-47F was designed to extend the service life of the Chinook class beyond 2030. Among its upgrades are new 4,868 shaft horsepower Honeywell engines, improved digital avionics, and an upgraded airframe with larger single-piece sections to reduce part count and need for fasteners. The new milled construction will reduce vibrations, eliminate points of joint flexing, and reduce the need for inspections and repairs, and reduce maintenance costs. It is also expected to increase service life. The CH-47F has a maximum payload of 26,000 pounds (10,615 kg). The United States Army has ordered 452 of the F models. In February 2007 the Netherlands was the first international customer to order the F model, six helicopters were ordered to expand their current fleet to 17. These six helicopters will be equipped with an upgraded version of the Honeywell Avionics Control Management System (ACMS) cockpit. Additional orders are expected from Canada and the United Kingdom. Based on operational experience in Afghanistan, the CH-47 was found to be an effective substitute for the UH-60 Blackhawk as an assault helicopter. With its larger payload, range, and higher operating speed, one Chinook can replace up to five UH-60s in this role as an air assault transport. On November 9, 2006, the HH-47, a new variant of the Chinook based on the MH-47G, was selected by the United States Air Force as the winner of the Combat Search and Rescue (CSAR-X) competition. Four development HH-47s will be built, with the first of 141 production aircraft to enter service in 2012. However, as of February 2007 this contract award has come under scrutiny by the GAO and the USAF may recompete the CSAR-X project. The CH-47J is a medium-transport helicopter for the Japan Ground Self Defence Force, and the Japan Air Self Defence Force. The CH-47JA is a long range version of the CH-47J, fitted with enlarged fuel tanks. Both versions are built under licence in Japan by Kawasaki. Eight CH-47C Chinooks were delivered to the Canadian Forces in 1974. The Chinooks were in Canadian service from 1974 to 1991; they were designated CH-147. These aircraft were subsequently sold to the Netherlands and are now operated by the Royal Netherlands Air Force as CH-47Ds. On July 5, 2006, the Canadian government issued a notice that it intends to purchase 16 Chinooks. Model 234 C-FHFB (cn MJ005) During inspection at Columbia Helicopters helipad adjacent to Aurora State Airport. Aircraft under lease to Helifor. Formerly G-BISN with British Airways. Model 234LR (Long Range) - Commercial transport helicopter. The Model 234LR can be fitted out, as an all-passenger, all-cargo, or cargo/passenger transport helicopter. Model 234ER (Extended Range) - Commercial transport version. Model MLR (Multi Purpose Long Range) - Commercial transport version. Model 234UT (Utility Transport) - Utility transport helicopter. Model 414 - The Model 414 is the international export version of the CH-47D. It is also known as the CH-47D International Chinook. 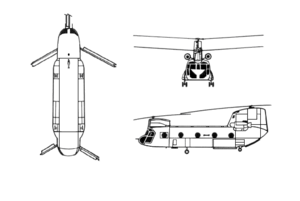 In the 1970s, the Army contracted Boeing to design a "Heavy Lift Helicopter (HLH)", designated XCH-62A. It appeared to be a scaled-up CH-47 without a conventional body, in a configuration similar to the S-64 Skycrane (CH-54 Tarhe), but the project was soon canceled. It was given a second examination in the 1980s and was again rejected. The scaled up model of the HLH was scrapped at the end of 2005 at Fort Rucker, Alabama. Boeing 234 flying in Civil Aviation Administration of China. Demonstration aircraft. On September 11 1982, at an airshow in Mannheim, Germany a United States Army Chinook (serial number 74-22292) carrying parachutists crashed, killing 46 people. The crash was later found to be caused by an accumulation of ground walnut shells that had been used to clean the machinery. On November 6 1986, a British International Helicopters Chinook crashed on approach to Sumburgh Airport, Shetland Islands resulting in the loss of 45 lives and the withdrawal of the Chinook from crew servicing flights in the North Sea. On 11 September 2004, a Greek Army Chinook CH-47SD carrying among others Patriarch Peter VII of Alexandria, crashed into the Aegean Sea, 5.5 nautical miles off Halkidiki peninsula killing 17 people. In 2005 two Royal Netherlands Air Force CH-47D's serials D-104 (w/o nov05) and D-105 (w/o jul05) crashed in Afghanistan in non combat operations. On June 1, 2006 a United States Army Special Operations CH-47 Chinook, on a routine flight from Hunter Army Airfield in Savannah, Georgia to Fort Rucker near Dothan Alabama, collided with a guy wire anchored to WXFL's 1000 foot tower located outside Doerun, Georgia. The pilot and three passengers, all US Army personnel, were killed. ↑ Type Certificate Data Sheet No. H9EA (.pdf). Federal Aviation Administration (January 17, 2007). Retrieved on 2007-02-08. ↑ CH-47D/MH-47E Chinook. Army Technology. SPG Media Limited (©2006). Retrieved on 2006-08-27. ↑ "Boeing's New CH-47F Chinook Helicopter Begins Operational Test Flights with U.S. Army", Boeing, February 19, 2007. ↑ Philadelphia Inquirer, August 17, 2007. ↑ "Boeing Signs Contract for Dutch Chinooks", Boeing, February 15, 2007. ↑ Warwick, Graham. "Chinook: CAAS unites rotorcraft cockpits", Flight International, 1 April, 2008. ↑ MH-47E/G Special Operations Chinook product page, Boeing. ↑ Air show safety in the spotlight, BBC, 27 July, 2002. Holcomb, Henry, "New Look Chinook", Philadelphia Inquirer, August 17, 2007. It uses material from the Wikipedia article "CH-47 Chinook". This page was last edited on 8 August 2008, at 16:13.